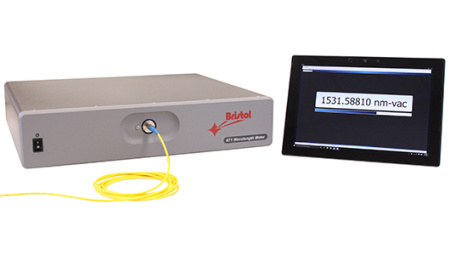 The fastest and most reliable method to measure the wavelength of pulsed and CW lasers. The 871 Series Pulsed Laser Wavelength Meter provides accurate wavelength information for researchers who need to know the exact wavelength of their CW or pulsed lasers. A unique Fizeau interferometer-based design measures absolute wavelength to an accuracy of ± 1 part per million. 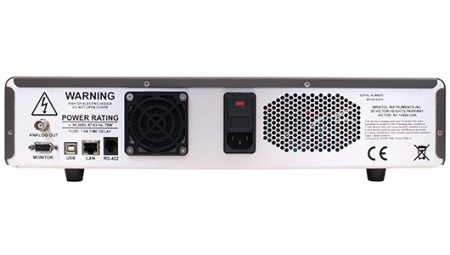 This design also enables a sustained measurement rate as high as 1 kHz, the fastest available. The 871 Pulsed Laser Wavelength Meter measures the absolute wavelength of pulsed and CW lasers to an accuracy of ± 1 part per million (± 300 MHz at 1000 nm). This performance is maintained over long periods of time because the system is automatically calibrated with a built-in wavelength standard. The calibration process takes less than two seconds, and can be set to activate automatically at a chosen time interval, or based on the system’s internal thermal conditions. The 871 Pulsed Laser Wavelength Meter uses a unique Fizeau etalon design to generate a spatial interferogram that is detected by a fast photodetector array. Using an on-board digital signal processor, the interferometric data is processed quickly into an accurate wavelength measurement. The combination of these technologies provides an unmatched, sustained measurement rate as high as 1 kHz. The wavelength of every pulse is measured for lasers operating at repetition rates of up to 1 kHz. At higher repetition rates, the system integrates all pulses arriving within a 1 ms window, or an external trigger can capture individual pulses. The 871 Pulsed Laser Wavelength Meter is available in two broad wavelength configurations to satisfy most experimental requirements. These ranges are the VIS (350 – 1100 nm) and NIR (650 – 1700 nm). A pre-aligned fiber-optic input ensures optimum alignment resulting in uncompromised accuracy. The system operates with a PC running under Windows, via a USB or Ethernet interface. Software is provided to control measurement parameters and to report data, or the system can become part of an experiment using a library of commands for custom or LabVIEW programming.